The first step is to discuss what type of guitar I want to build and then spend a little time drawing up some plans. Students can build any guitar they desire. My design is inspired by a pre-war Martin ‘000’. 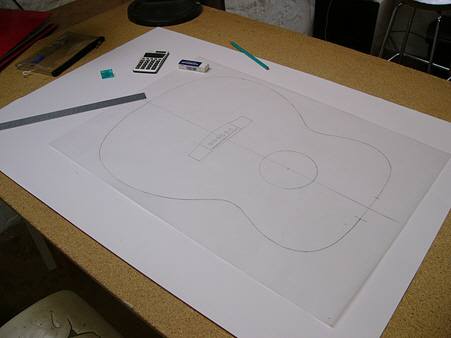 The school has existing plans for this type of guitar so the first job is to create my own drawing on tracing paper which will be transferred to a plywood template. 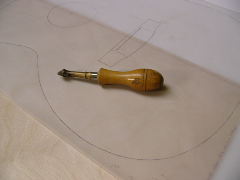 The template is a very important piece - it will be used in the preparation of a detailed full-scale plan, to mark out the guitar outline on the prepared front and back blanks, to prepare the gluing mould, as a guide when bending the sides, and for many other jobs throughout the build. A toothed wheel a bit like a cookie cutter transfers the template outline from tracing paper to the plywood which is then cut out with a fretsaw and the edges smoothed. 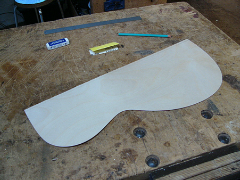 A half template is used so that both sides of the guitar will be perfectly symmetrical. The School has access to a great selection of seasoned tonewoods kept by Norman Reed Guitars. 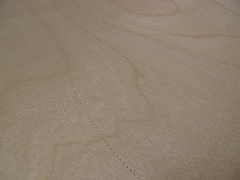 Timber is well seasoned by the tonewood supplier and then kept at the shop for at least another five years before use. 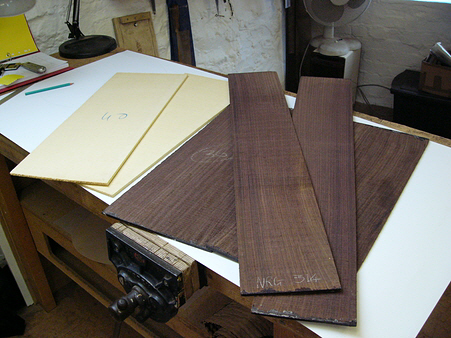 Front and back sets are bookmatched (consecutive slices from the same quarter-sawn log which will be joined like the two opposite pages in a book) and backs and sides are also matched from the same log. I’ve chosen a nice set of close-grained European Spruce for my top and some beautiful East-Indian Rosewood for the back and sides.